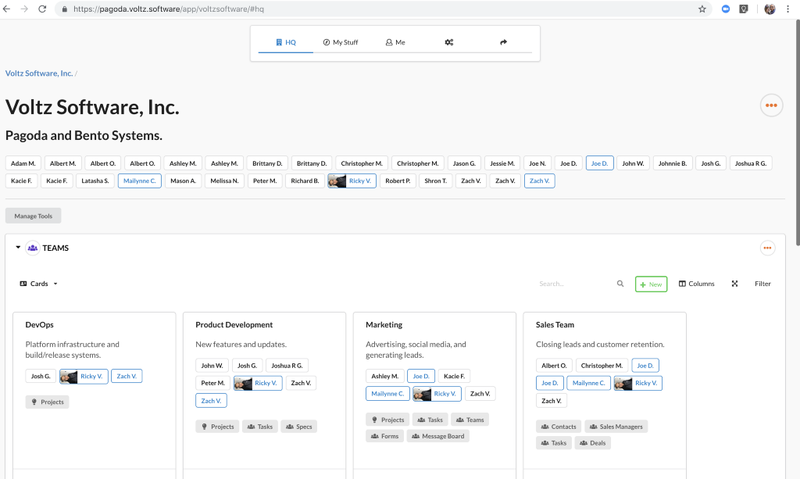 With this update, we have introduced a way for businesses and business teams to organize their work force. This feature is a big update from the way users used to interact with the Bento application. Previously, there was a side navigation bar that allowed access to every type of system in our application. While convenient, it was also extremely overwhelming when people first logged into the system. The new Headquarters concept aims to simplify this by presenting a centralized place to manage our clients’ data. When a user first logs in, they will be presented with their Headquarters view. 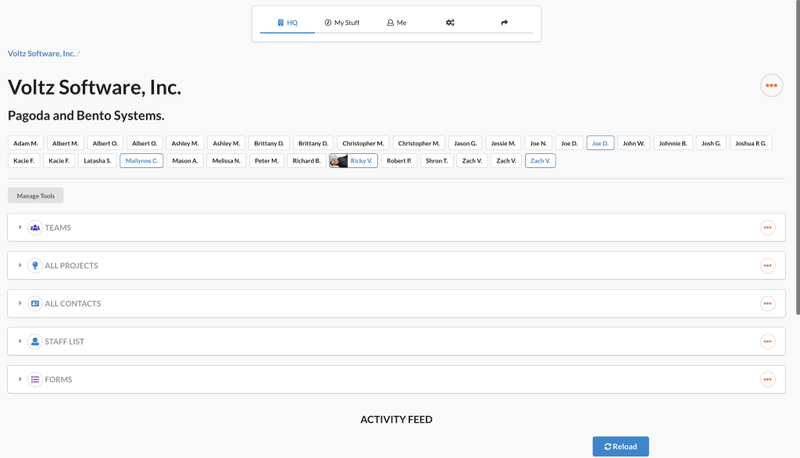 This view is customizable so that our users will only see the information that’s relevant to them. Below is a screenshot of our company’s Headquarters. You can see we are currently using 5 different tools. Teams, Projects, Contacts, Staff, and Forms. There are more tools available and any of the 5 we are currently using can be renamed or removed entirely. 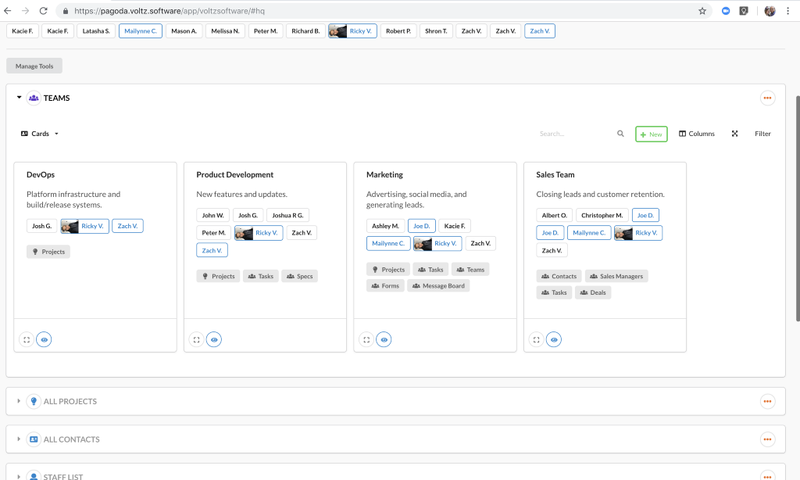 Teams is a new feature that allows our users to organize their staff into logical groupings. If a user has a sales team internally, we recommend setting up a Sales Team in their HQ. Same for any other team within the organization, such as an Admin team, HR team, Account Management team, Customer Support team, etc. Teams can be used to create a 1:1 representation of an organization. And since teams can be created within other teams, representing complicated organization charts in Bento is not a problem. This is a bit of a new concept for our users, but it should provide great flexibility in data management. Tags are very similar to hashtags used in many other systems. Many objects in Bento can be tagged (Clients, Teams, Projects, Invoices, Contracts, etc.). Tags should be used to create groupings of information. For example, a sales team may tag all new leads with a tag ‘New Lead’ and another tag with the sales person’s name ie: ‘Joe Deluca’. This will allow the users to quickly access the data that’s important to them. 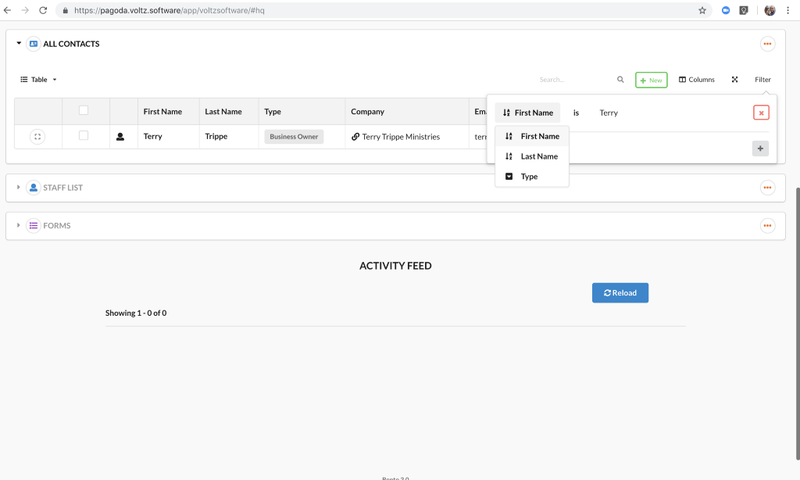 Pools takes the tag concept a little further and gives our users the ability to create entire groups of related information for specific people in their organization. 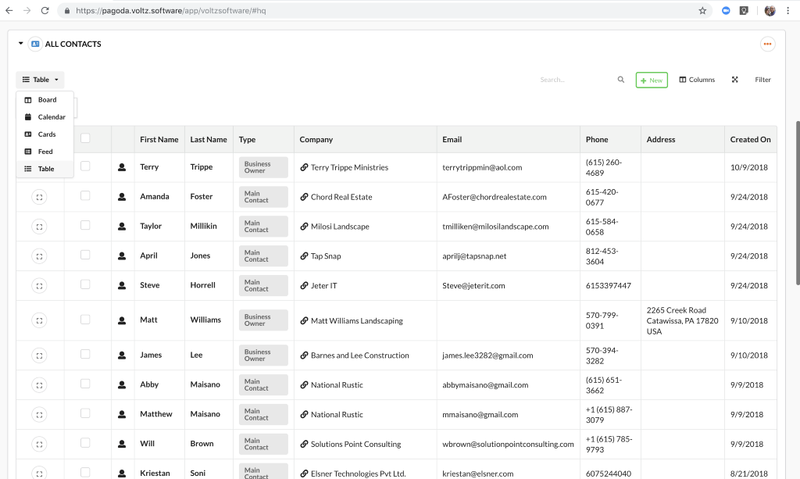 Because we used the team feature to create teams for Mailynne and Joe, we have additional functionality within each of those teams. After opening Joe’s team, I can see even more detail, specifically related to Joe. As you can see, the tools used in Joe’s team are different from what we are using in the HQ and even the Sales Team. You can also see the tags associated with this team in the top left of the screenshot above. Sales Team and Joe Deluca are both applied to this team. 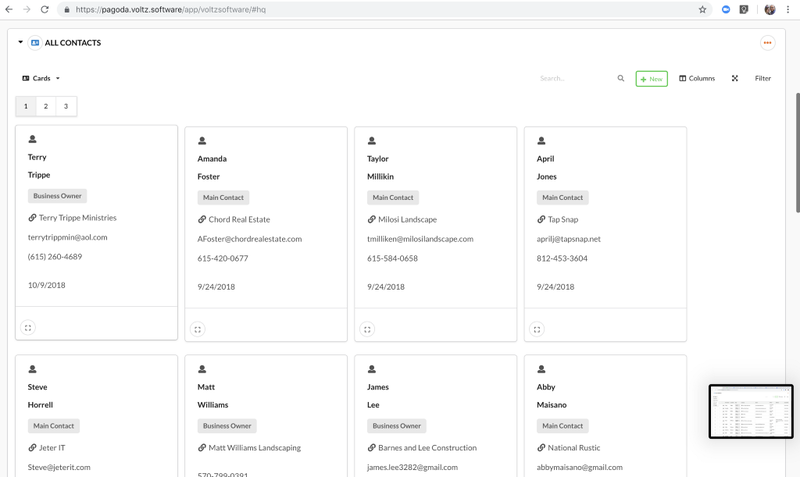 If we expand the Contacts tool, you’ll see that the contacts available in this team are a subset of all the contacts in the system. Specifically, these contacts all have the Sales Team and Joe Deluca tags on them. This same functionality applies to any object that can be tagged in Bento. 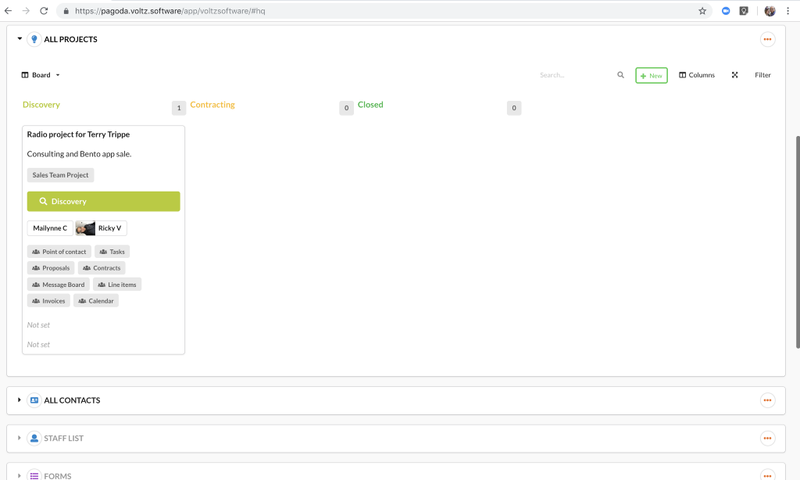 So by using Tags and Teams, our users will be able to create a very customized application for their organization. Tags will help silo or pool information the way they want. Tagging is also not an either/or thing. For example, a contact tagged with Joe Deluca and Mailynne Calvin will show up in both teams, not just one. This is a new way to view information that is now being used throughout the application. It provides a new level of functionality for our users to view information related to their business. In the screenshots above, you’ll notice some consistency in the table and card views of contacts and teams. That’s the new Collections component. 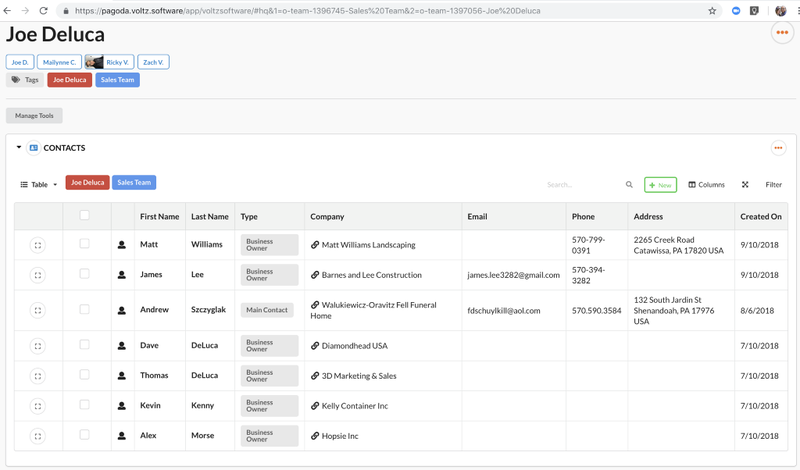 This new component allows us to view any collection of data (think list) in a standard way. View collections in a Table, as Cards, in a KanBan board, in a List or in a Calendar. Go full screen. View a collection in its own window. Filter collections by multiple parameters. URL navigation for single page web applications has always been tricky. Since the page never really reloads, getting the browser back and forward buttons to behave correctly is a challenge. Every page in the application now has its own URL. Meaning you can copy and paste the URL in an email or message, and the link will take the user back to the specific page it came from. This also means the browser is aware of the application’s navigation. So back and forward buttons now work as expected. You can even swipe back on devices that support that gesture. This update also allows us to present a more cohesive navigation experience for our users. 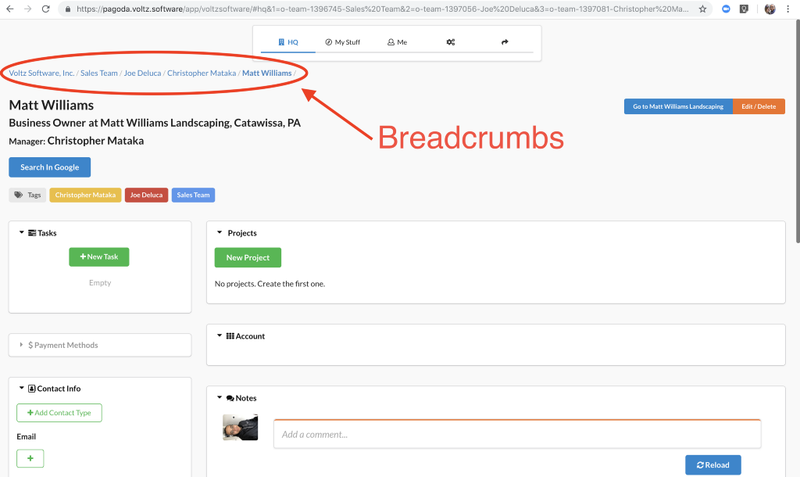 We now have a breadcrumb style navigation bar that forms at the top of the application as the user navigates around. You can see the breadcrumb in the screenshot below. There are some large updates in this release that we are really excited to share to help the productivity and organization of our clients. 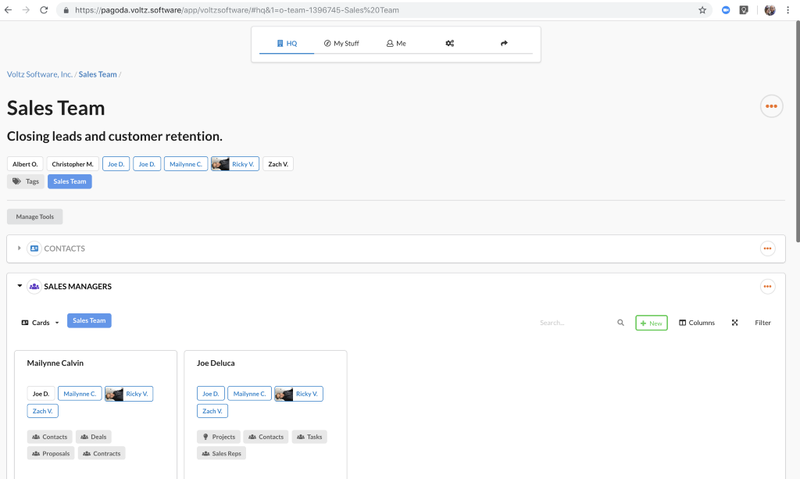 On top of the visual and functional updates we’ve shared above, there was a lot of refinement “under the table” to create more efficiency and stability for our current users and new clients that come on board. If you have questions about any of these updates or how you could use the Bento application for your organization visit our Bento Systems website. 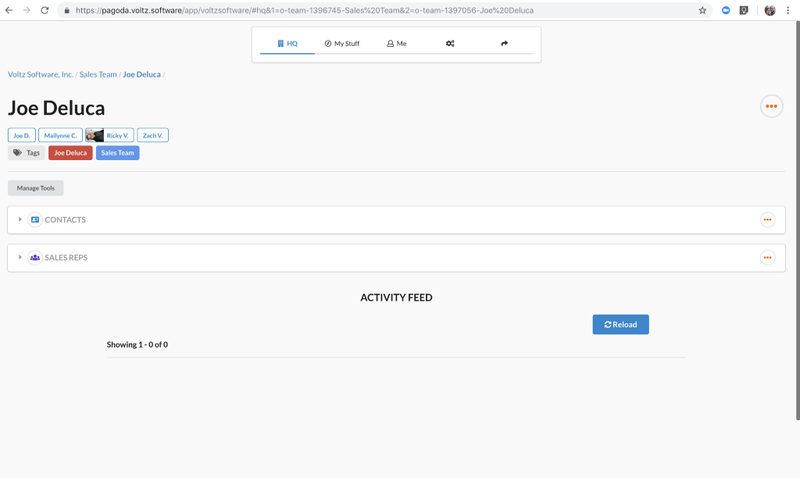 Bento Systems Software Update: Release 3.0 was originally published in Bento Systems on Medium, where people are continuing the conversation by highlighting and responding to this story. Start your free 30-day trial now. Bento team: Why is there so much Japanese culture in the Bento brand? Why we don’t have a mobile app, and why you shouldn’t either. We are problem solvers. As a team, we have been working with businesses for more than 10 years utilizing web-based technologies to improve business operations. We have worked directly with business owners and heard their challenges loud and clear: business operations can become overwhelming. We’ve seen this from startups to companies who have experienced wildly successful growth and every phase of business in between. That being said, we know that each problem has a solution and many times web-based applications solve many of the operational issues we’ve seen. The solutions we’ve been able to provide vary from internal staff and team management, HR, communication with clients, billing, contract signing, inventory management, scheduling, automation, system notes and many other aspects of business operations. 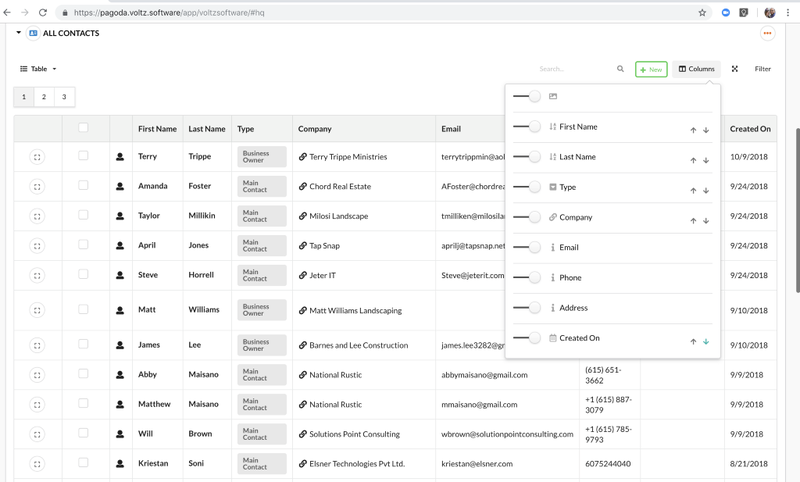 In all cases, we’ve been able to create better systems for a business, keep that information in one simple to use system, and reduce the headaches business teams experience on a daily basis.